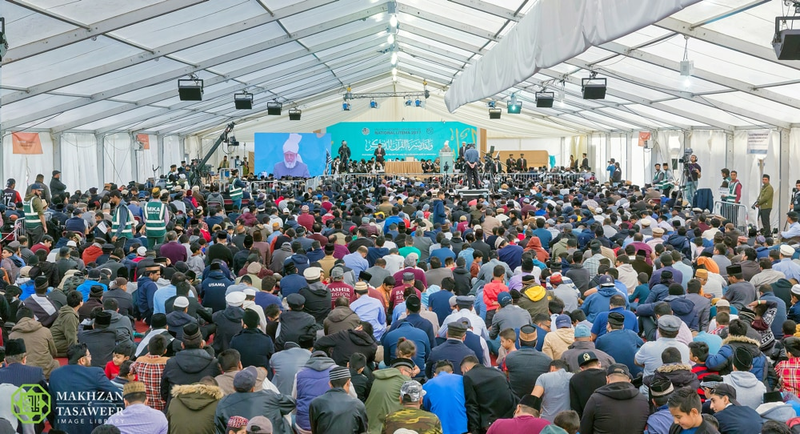 Hazrat Mirza Masroor Ahmad addresses over 5,500 Muslim youths from across the UK. The objectives of the Ijtema, held for the first time at Country Market, Kingsley, were to educate the Muslim youths of the true peaceful teachings of Islam and to inspire them towards serving both their faith and nation to the best of their abilities. 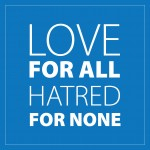 Commencing on the same day as the Parsons Green station attack, the Ahmadi Muslim youth were united in their condemnation of all forms of extremism and terrorism and during his keynote address, Hazrat Mirza Masroor Ahmad repeatedly stated that Islam promoted love and compassion for all mankind. 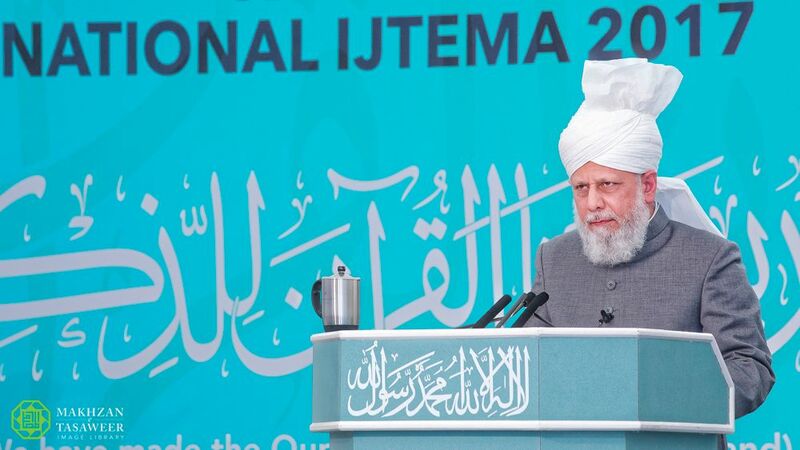 His Holiness delivered a comprehensive commentary on the Islamic creed and said it was not enough to merely proclaim these words, rather they had to be accompanied by a manifestation of one’s faith through the worship of Allah and by following the noble example of the Holy Prophet (peace be upon him). His Holiness further explained the meaning of the creed in light of the teachings and explanations of the Founder of the Ahmadiyya Muslim Community, Hazrat Mirza Ghulam Ahmad, the Promised Messiah (peace be upon him). His Holiness also explained the love that the Holy Prophet (peace be upon him) had for reading the Holy Quran and following its instructions. His Holiness also outlined the aspects of the life of the Holy Prophet (peace be upon him) which illustrated how he fulfilled his responsibilities towards the society and the creation of God. His Holiness said that even after a difficult and strenuous defensive battle against a Jewish tribe, the Holy Prophet (peace be upon him) fulfilled the rights of his opponents. His Holiness said the Muslims were on the verge of starvation after a long battle when a shepherd from amongst the opposition accepted Islam and joined the Muslims. He brought the sheep under his care with him and enquired what should be done with them. Elaborating upon the need to give precedence to one’s faith, His Holiness said that the Holy Quran has instructed Muslims to leave their businesses during the Friday prayers and come to the Mosque, however, there were many Muslims who gave priority to material pursuits over their faith. Further, His Holiness said that it was common to see people deceiving others or resorting to falsehood in business transactions. However, the Holy Prophet (peace be upon him) was so particular with regards to avoiding all types of falsehoods, that he advised his companions to give charity before conducting any form of business, which would shield them from wrongdoing. 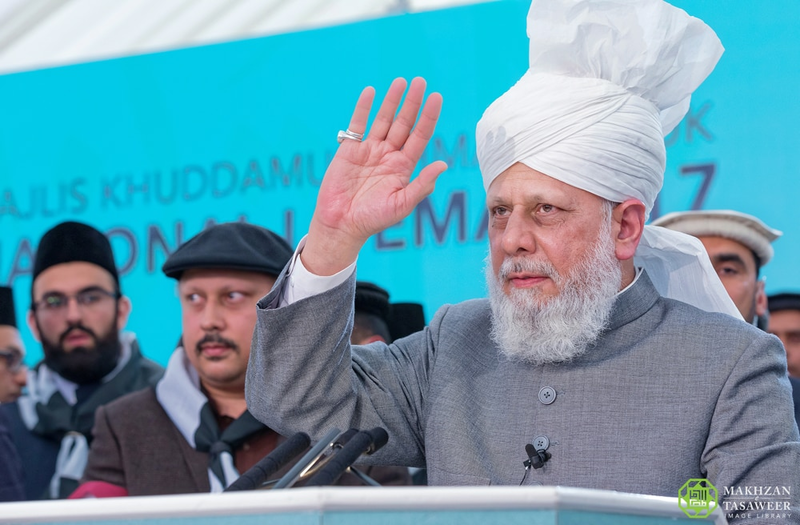 His Holiness quoted a saying of the Holy Prophet (peace be upon him) which states, that ‘a true Muslim is he from whose tongue and hand all others are safe’. Elaborating the loving and kind character of the Holy Prophet Muhammad (peace be upon him), His Holiness shed light on the rights given to women in Islam and the kindness that Muslim men should show towards their family members. 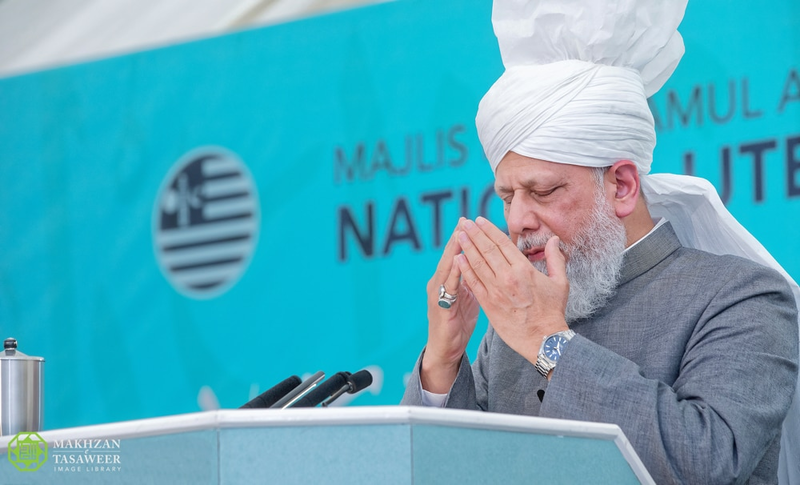 Concluding his address, His Holiness said that Ahmadi Muslims must seek to fulfil the mission of the Promised Messiah (peace be upon him) which was to make the world recognise its Creator and to serve mankind. 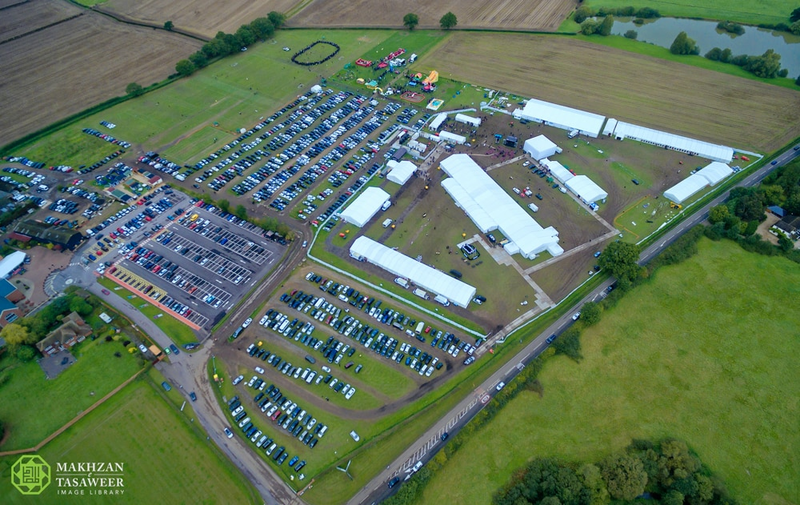 Earlier, a report was presented by Mirza Waqas Ahmad, the National President of the Ahmadiyya Muslim Youth Association during which he informed of the various activities of the 3-day event. During the Ijtema, Ahmadi Muslim youths from over 100 local communities from across the United Kingdom (Qiadats) competed in various academic and sports competitions, including a special Kabaddiexhibition match. The Muslim youths were also able to visit the ‘The Hub’ where they had the opportunity to ask questions in a confidential environment about religion or social issues. A number of renowned experts in different academic fields also travelled to the Ijtema to deliver talks to the young Muslims.